Stansted to St Pancras Station Taxi – Stansted to St Pancras Station Taxi Service: St Pancras International Station practically represents the highlight of all the railway stations in London. It has the most beautiful architecture and interior design, all possible due to the vision of Sir George Gilbert Scott. 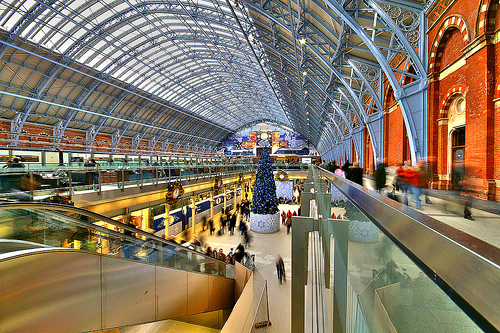 Moreover, to its already luxurious décor, champagne bars, impressive bookshops and 5 stars restaurants have been added to St Pancras International Station’s glamour. However, we should never forget that it also provides the fastest railway service. You can be in France or Brussels in less than 2 hours, not to mention all the other European destinations and the rapid connections to London’s most important airports. We have prepared at the end of the article a series of airport transfers options, in case you are a traveller or a business man or woman that is arriving on Stansted Airport. After you arrive in the St Pancras International Station area, we would recommend that you choose one of the accommodations that are situated nearby. For example, you could try: Great Northern Hotel (King’s Cross St Pancras), Pullman London St Pancras (100-110 Euston Road) and St. Pancras Renaissance London Hotel (Euston Road). Once you have found a suitable hotel, you practically have all London at your disposal, as all the important railways stations are at a walking distance. Thus, no district is too far away and you can do all the sightseeing that you want. The capital of the United Kingdom is filed with beautiful views and amazing buildings. All the British symbols are characterized by grandeur, elegance, a mix of modern and vintage. Some of them are red objects (the double-decker bus, the renown phone booth, etc. ), others are famous personalities (the Royal members, football players, actors, etc. ), but all represent the essence of Londoners and their belief in modernization, vision and accessibility, even if it regards the Royal family, the local attractions or domains and industries such as transport and tourism. In order to get a Stansted to St Pancras International Station by rail, you have the train from Stansted Airport (every 15 minutes) via Tottenham Hale Underground (every 5 minutes) and then simply walk for 1 minute. This whole journey takes about 46 minutes. Another option would be to take the bus from London Stansted (every 30 minutes) via Liverpool Street (every 10 minutes – line 205) and then enjoy a short walk of 1 minute. This journey will take about 1 hour and 21 minutes. A Stansted to St Pancras Station Taxi Transfer by car can be done by taking the M11 motorway. Stansted Airport is at a 36.9 miles distance from St Pancras International Station. This journey will take about 53 minutes, without including traffic. A Stansted to St Pancras Station Taxi with 247 Stansted Airport Transfer is going to take about 1 hour and 19 minutes, including rush hour traffic. 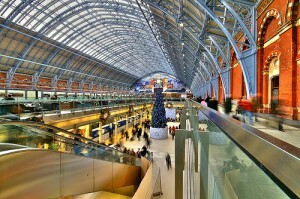 The price for a Stansted to St Pancras Station Taxi starts from 68 GBP. Stansted to London Bridge station taxi.